4Media iPad Video Converter is the ideal solution for playing movies, videos and music of various formats on your iPad. This iPad converter can decode just about all popular HD and SD video formats such as AVCHD (*.mts, *.m2ts), H.264/MPEG-4 AVC, H.265/HEVC, AVI, MPEG, WMV, DivX, MP4, MOV, RM, RMVB, ASF and 3GP, and then convert them to iPad 720p H.264 HD or H.264 & MPEG4 & MOV formats. 4Media iPad Video Converter also has the ability to decode CD, extract iPad music from videos and convert all sorts of music formats to iPad-compatible MP3, WAV, AAC or AIFF format. 4Media iPad Video Converter has introduced NVIDIA CUDA and AMD APP technology, making video conversions 5x faster. Click here for details. This iPad converter supports multi-core processing, batch conversion and multithreading, thus allowing you to convert multiple multimedia files with the highest speed possible. Decodes HD video formats including AVCHD (*.mts, *.m2ts), H.264/MPEG-4 AVC, H.265/HEVC, MPEG-2 HD, MPEG-4 TS HD, MPEG-2 TS HD, Quick Time HD, WMV HD and AVI HD, and converts them to iPad 720p H.264 HD, H.264 & MPEG4 video formats. Convert nearly all popular video formats like MPEG, WMV, DivX, MP4, MOV, RM, RMVB, ASF, 3GP, and AVI to iPad H.264 & MPEG4 & MOV videos. Using the versatile iPad converter, you can also extract iPad music from any of the supported video types and convert music formats such as MP2, WMA, RA, AC3, OGG, APE, and CDA to iPad MP3, WAV, AAC or AIFF audio. Multi-core CPU allows accelerated iPad video conversion; the more cores you have, the higher the conversion speed. This iPad converter can convert multiple files to iPad videos and music at the same time. Newly added NVIDIA CUDA & AMD APP technology which features to promote the converting performace greatly. Output converted videos to iPad, iPhone4 or other devices right away the conversions complete to facilitate users. All conversion profiles are optimized to simplify your conversion. Adjust output parameters of an existing profile such as bit rate, frame rate, sample rate, channel, codec, aspect ratio and so on, then save it as a new profile. The profile list is sorted by different types. 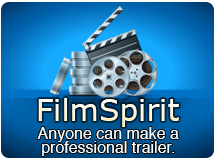 Split a file into several parts automatically during conversion by specifying a split mode using 4Media iPad Video Converter. Set the start time and duration of a video segment you want to extract, and then convert it to iPad video/music. This iPad video converter will output multiple format files from the same file simultaneously as you specify. Define the output file size with corresponding video bit rate computed instantly using the Bitrate Calculator in this iPad video converter. Capture pictures from a video automatically at regular intervals or take snapshot of movie images manually when previewing a video. The player can be switched to be stand-alone with adjustable aspect ratio (4:3 and 16:9). Preset your application to auto exit, or shut down, hibernate, standby your system after a conversion is completed. Run iPad Video conversion tasks in the background so you can easily run other applications at the same time. 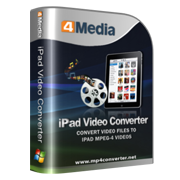 4Media iPad Video Converter is available in six language interfaces: English, French, German, Spanish, Japanese and Chinese.